Supremacy MMA allows players to experience the fast moving world of professional mixed martial arts from the comfort of their own living room and it is one of the most realistic experiences I have ever had. The game features state of the art graphics which are very smooth running but the game play engine of the game and the controls of moves and so on is what lets the game down. I found the controls to be very complex and far too hard to be using whilst in the middle of a battle which is a real shame as the game could have been so much better. 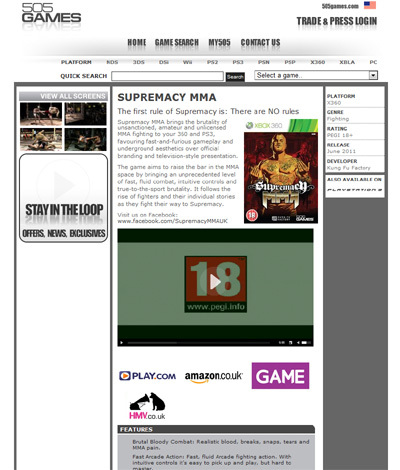 We have also compiled a Review System for this, of which Supremacy MMA is Rated as Three Stars, the third highest possible score available from the Game Review Team.